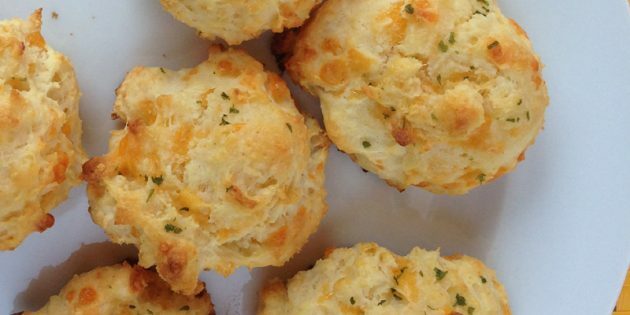 One thing that everyone loves when they go out to this seafood restaurant is that tantalizing smell of garlic cheese biscuits. I can smell them right now, as my husband sits there and gives me the apologetic look and then devours them, since he gets them all to himself. Well, not one to stand around and be left out, here’s my version of these awesome little garlic cheese wonders. You can easily do this at home. And since they’re drop biscuits there is no need for extra flour or a rolling pin. Using a fork or pastry cutter; combine baking mix and cold butter in a medium mixing bowl. Keep cutting in the butter until coarse crumbs form. Or you can do what I do because I’m always way more into using power tools in the kitchen and in the bowl of a food processor, add the biscuit mix and the garlic powder. Pulse a couple of times to combine. Open the lid and drop the cut up butter all around the bowl. Put the lid back on and pulse until crumbly. Then add the milk, cheese and eggs and pulse until it comes together. Using a 1/4 cup measuring cup, drop portions onto a parchment lined baking sheet. You should end up with 10-12 biscuits. Let them sit for about 5 minutes. Then pop in the oven and bake until golden brown, about 10 to 12 minutes depending on your oven. Make sure to check a couple minutes before the 10 minutes is up. You never know how fast these may bake up. Remove the biscuits from the oven and transfer to a wire rack to cool. Combine the melted butter, garlic powder and parsley in a small bowl. 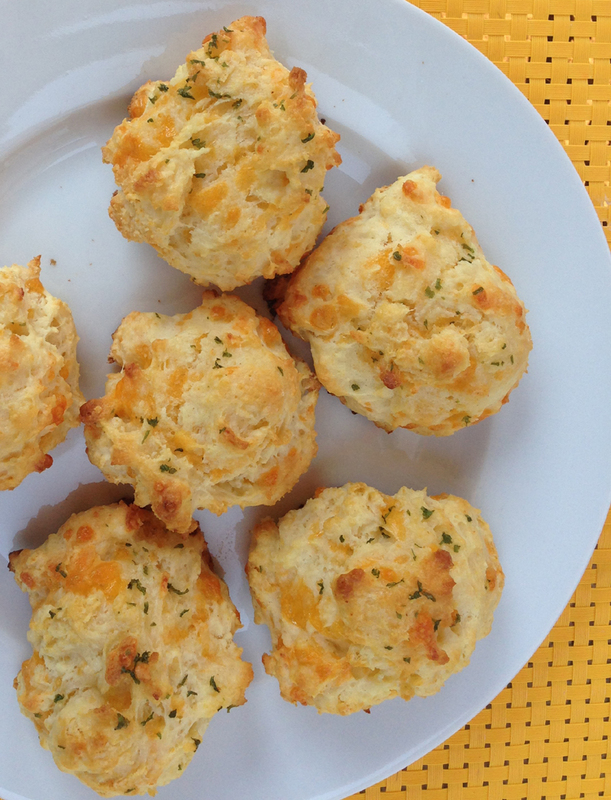 Using a silicon brush, gently brush the garlic butter on top of the biscuits. If you click on any of the links on this post we will receive a small commission! Thank you for making it possible for us to keep posting!! 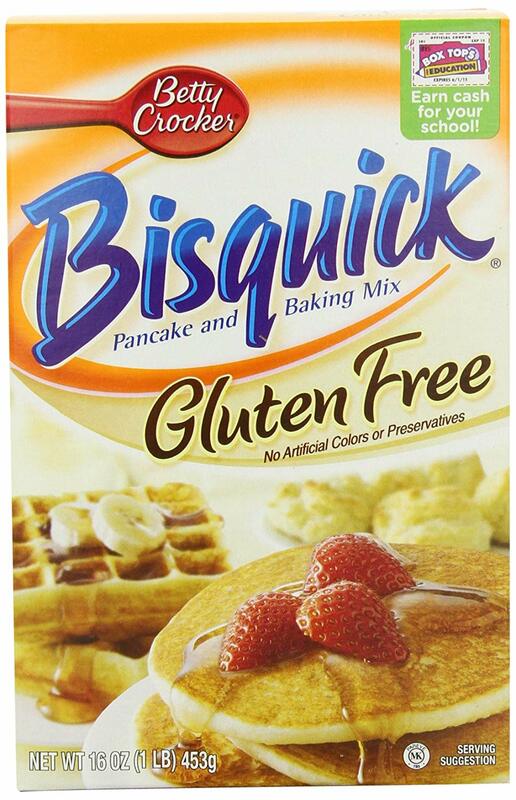 As mentioned above I used the Betty Crocker Gluten Free Bisquick. We all know how hard it is to find a good mix that doesn’t taste like the box that it comes in. Well I’m happy to say that this one tastes almost exactly like the original Bisquick. Finally we found one that tastes as good as the original just open up the box mix and ready to go. Click on the link to grab a couple boxes for your pantry and to try out this recipe trust me you will need more! 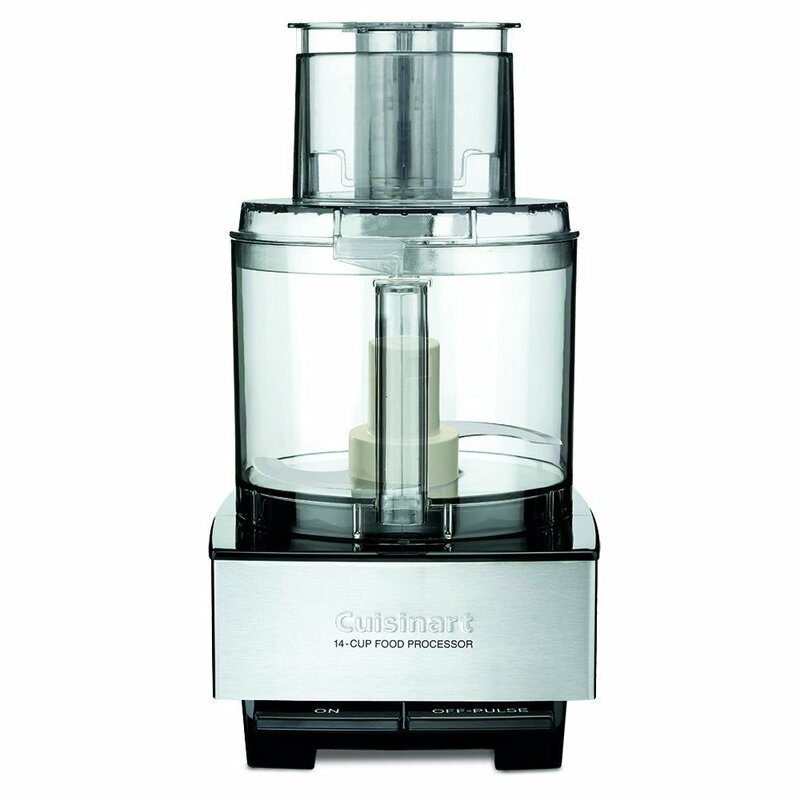 For a great Food Processor that is one of the staples in my kitchen I use the Cuisinart Food Processor. It will puree, chop, shred, and slice whatever you need in a timely fashion. If your like me and the more power tools in the kitchen the better, you will see the power behind this thing as it shreds up a pound of cheddar cheese in no time while not getting all gummed up. I love my food processor and use it for anything I can. To pick one up for yourself or as a gift for some one you care about, click on the link. 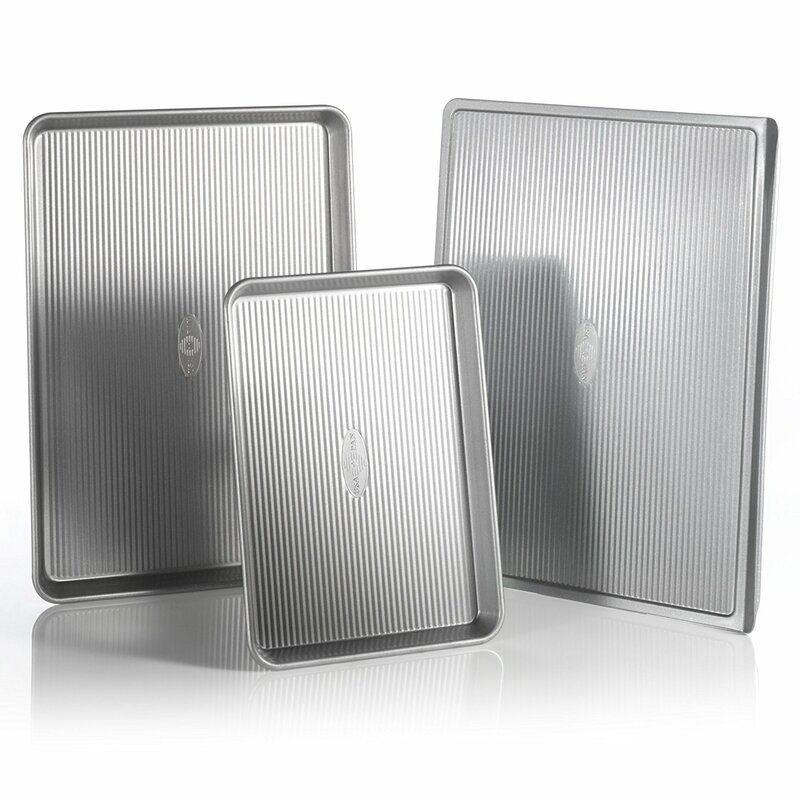 For amazing baking sheets that heat evenly and bake things to perfection use the USA Baking sheets. They are some of the best baking sheets I have ever had and everything I have used them for has come out absolutely amazing! These biscuits slid right off the pan and the bottom was a perfect golden brown. Best part is they are made right here in the USA! To get some of your own click on the link and it will pop you over to where purchase them!